the National Register of Historic Places in a letter dated December 17, 2018 from the Illinois State Historic Preservation Office. The newly created district contains a 17-block area in the City of Peoria’s Central Business District. Roughly bounded by North William Kumpf Boulevard, Perry Avenue, Fulton, Fayette and Water Streets, the district is made up of Peoria’s earliest commercial developments dating from the city’s early growth period in the 1870s to the Post World War II urban renewal period. The district’s diverse architecture and continual building activity over the century demonstrates continued vibrancy and relevance of downtown Peoria as a commercial, governmental, and cultural center. with both designations may also qualify for a state historic tax credit. 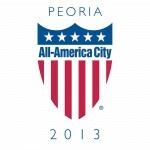 For more information, contact City of Peoria Senior Urban Planner Kimberly Smith (309) 494-8612.